With Summer finally underway (bye,bye good hair days, hello frizzies! ), I often find myself gravitating more towards cream, liquid, and stain blushers, since they seem to perform better on extremely hot and humid days. June marks the beginning of rainy season over here (it's actually pouring outside as I write this post), and with the humidity levels rising, I've been reaching for TheBalm's stainiac almost every single day. Stainiac is a light weight gel-like formula that comes with a doe foot applicator. The stains gel-like consistency allows the product to spread and blend easily. Stainiac doesn't dry quickly, providing enough time to ensure an even streak free lovely flush. I love the velvety soft doe foot applicator. I find the doe-foot to be much easier to work with than a brush or fleet tip applicator. 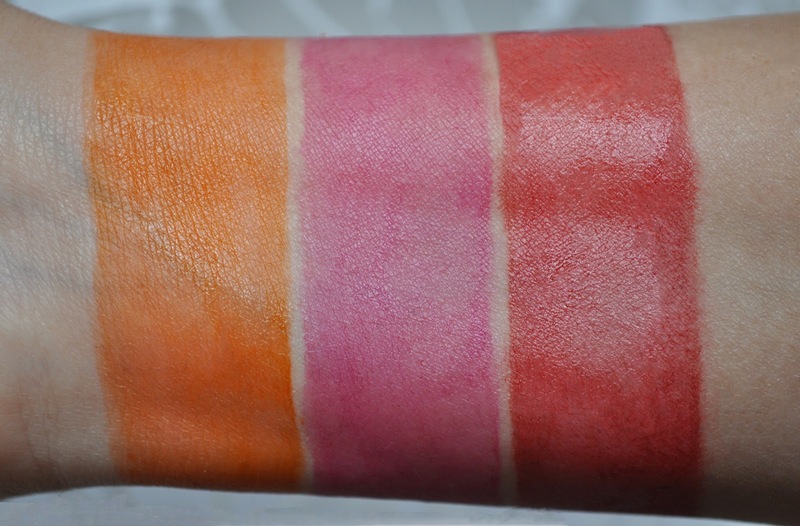 I love using this stain on both my cheeks and lips, the pigmentation is fantastic! Stainiac can be applied lightly for a subtle, yet natural flush, or built up for a more intense vivid color. I love how this product feels on my skin, as well as my lips. Neither my cheeks nor lips ever feel dry, tight or constricted. Also, the staying power of this product is ridiculous! This stain last ALL day and then some!! From left to right: Homecoming Queen, Beauty Queen, and Prom Queen. Homecoming Queen: An exquisite orange Popsicle stain that's playful, yet sophisticated. My favorite of the three Stainiacs. Beauty Queen: A charming raspberry stain. Prom Queen: A flirty strawberry stain. Stainiac is an amazing product, an absolute favorite! 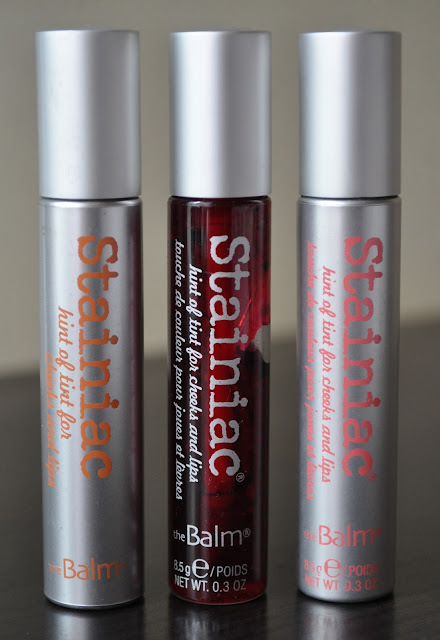 I adore all three of my children equally...okay, maybe I have a little more love for Homecoming Queen, then the other two, but their all gorgeous just the same :P If your a lover of cheek stains or interested in purchasing one, I highly, HIGHLY Recommend TheBalm's Stainiac! Stainiac can be purchased at thebalm.com (TheBalm does offer international shipping) or wherever else TheBalm is sold and retails for $17.00 (8.5g/0.3oz). Have you ever tried TheBalm's Stainiac? I prefer the one in the middle (Beauty Queen). Beauty Queen is gorgeous as well, I've been wearing it over Homecoming queen this week and it's pure love! Summers are extremely Humid over here, so stains are my saving grace! Pat Me A Mani As Fast As You Can! Life's Full of Mini Thrills! Running on Empty: May Empties!